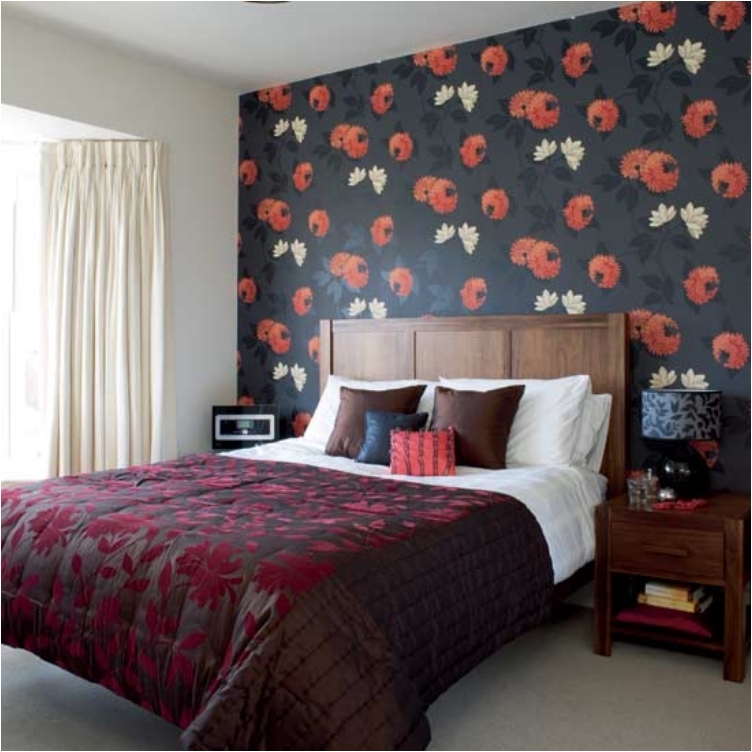 When it comes to decorating the walls, a lot of people think that such a luxury costs a fortune. Well, that can’t be further from the truth. 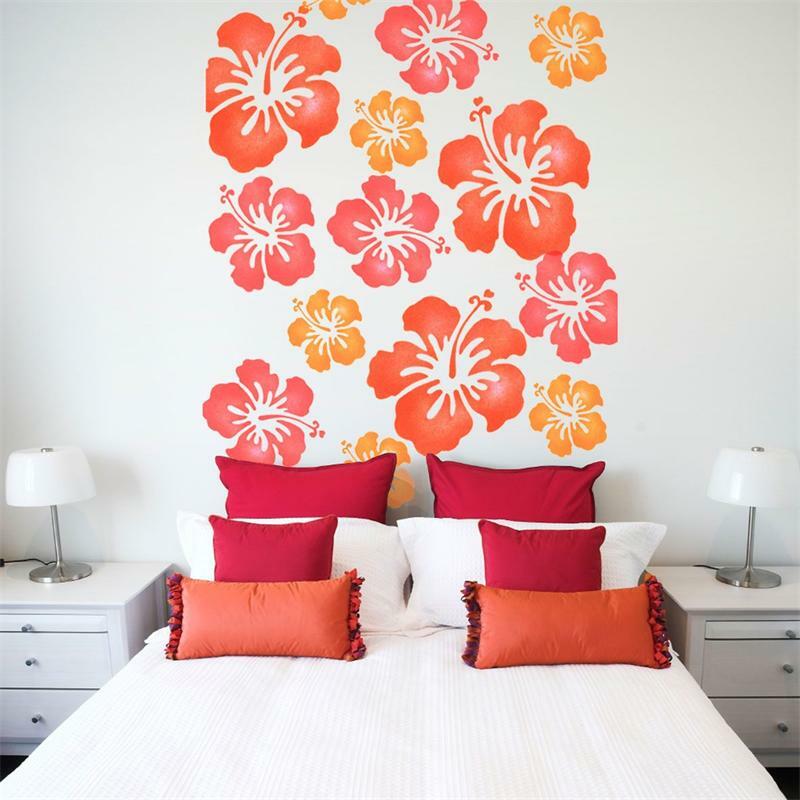 In reality, decorating the walls can be very easy and inexpensive. All you need is some wall art. 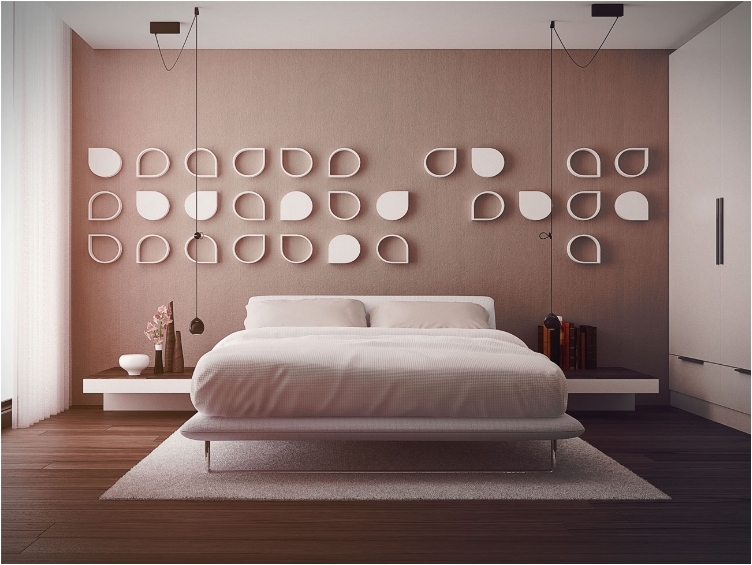 Thankfully, in the past few years, wall art has become a popular decorative item. You can find countless of ideas. 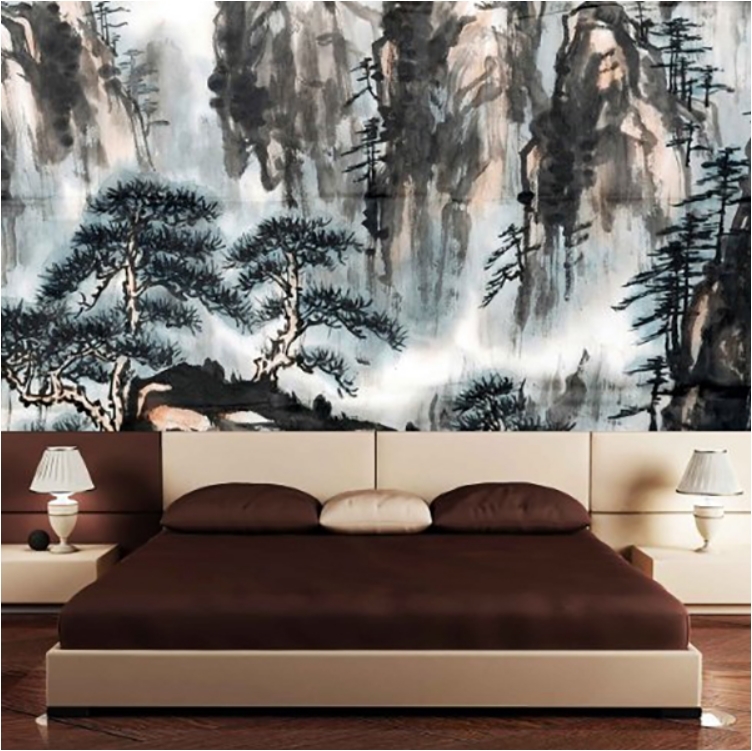 Today, I will try to give you some ideas that you can use to add color, texture, and art to your bedroom. 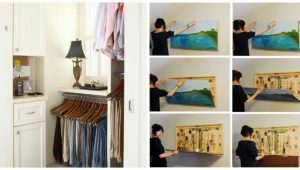 This way, you can decorate your bedroom without paying for an art painting. 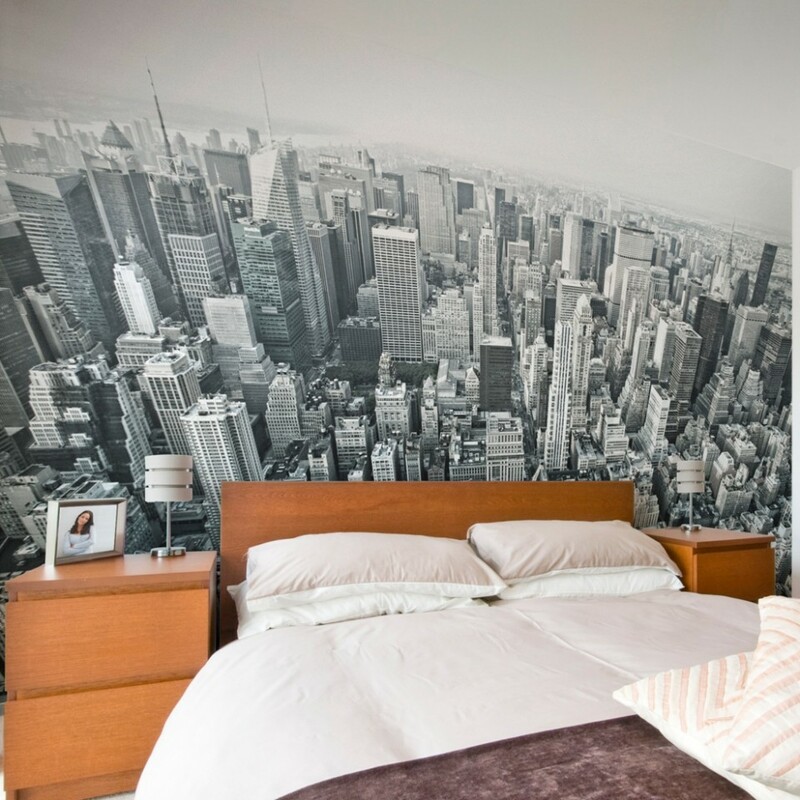 Believe me, your bedroom will be completely transformed. Let’s start with something simple—butterflies. We all love butterflies. They are so beautiful and fun. Most importantly, butterflies bring a certain feeling of nature to the room. 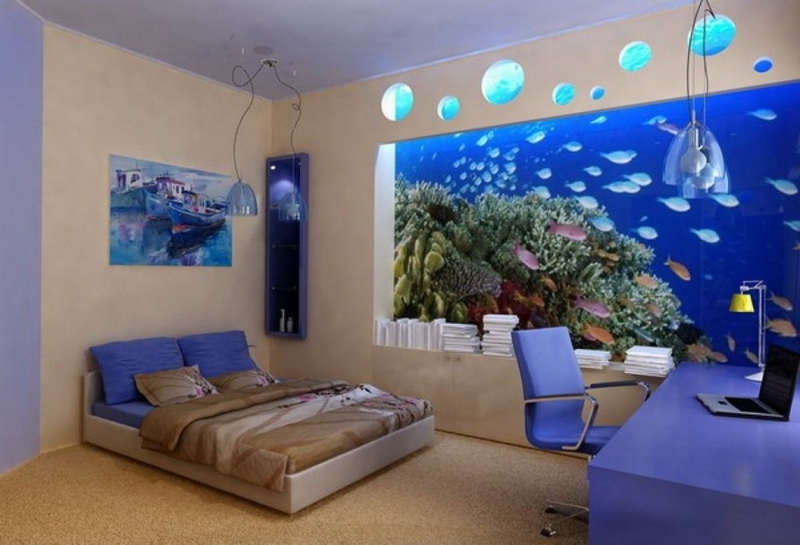 Some people just want to take things to the next level, and that is what this underwater theme does. 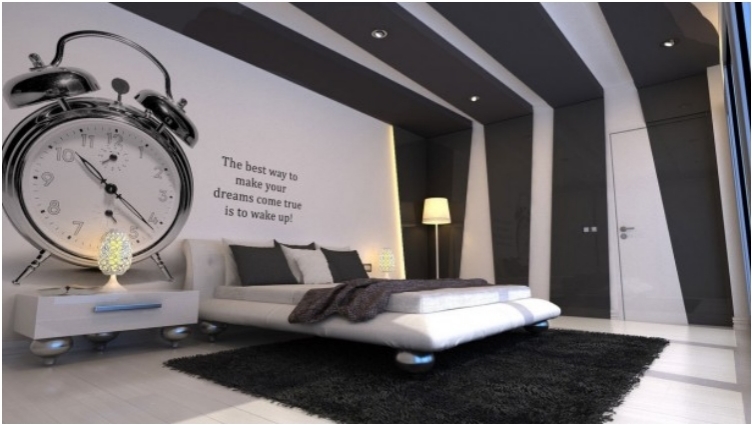 You add another dimension to your bedroom with this wall art. 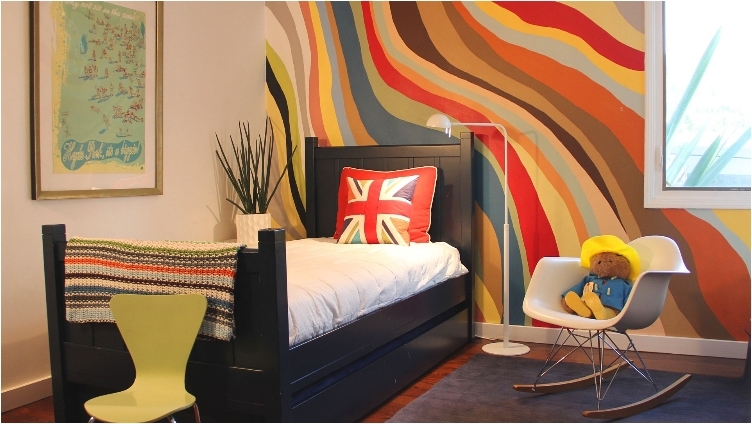 And I love how the room follows the colors and theme of the wall. City art has become very popular in recent years. There was a time when people wanted a view, so we had decorative curtains with city views. Now we have the city’s skyscraper designs on the wall. Think of it as a way to go to bed in Paris or New York! You actually have several elements here. 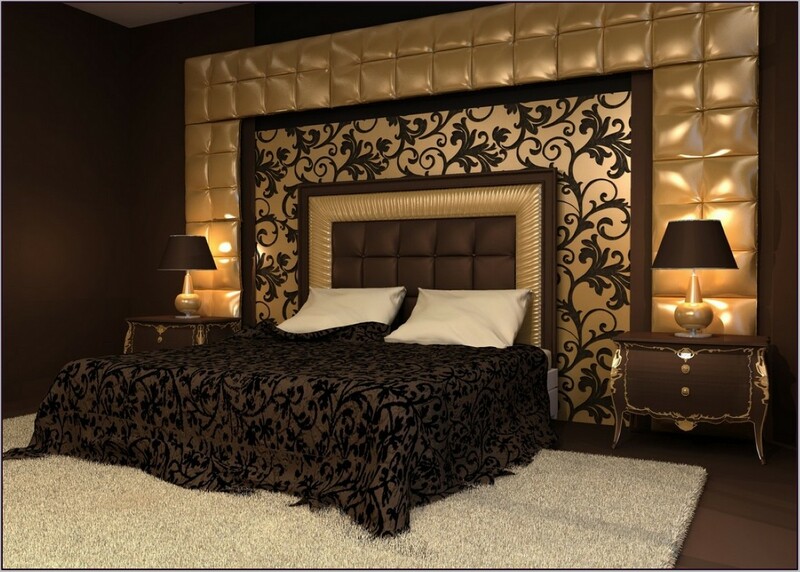 Let’s start with the brown faux headboard that adds so much texture to the room. And then you have the “you and me” wall art on the side. Just a perfect, simple message to emphasize love in the bedroom. At first glance, these drops look strange. Like, what are they? What are these forms? But they are so emotional. Raindrops (or drops, in any case) bring emotion to the room. And you can say they add a certain romantic note as well. More nature-inspired art. 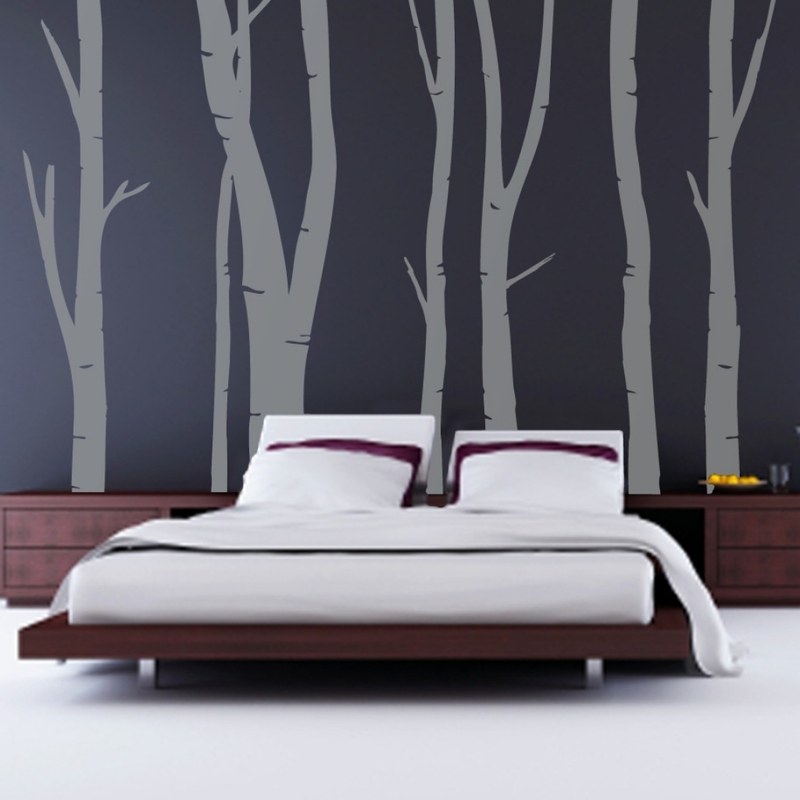 Nature and the environment have been huge parts of decoration in the past few years. We’re all looking for ways to be more “green.” Now, this tree isn’t green, but it still symbolizes your support for nature. There are people who want simple things, and there are people who want complex things. This wall art is for the latter. Not that there’s something wrong with the alphabetical swirl, but I have to be honest—it looks a bit chaotic and too much for my taste. But I have to offer something for people who love these things. Flowers have made a comeback in interior design, thanks to French Country. 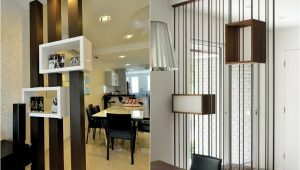 This interior design style has become more and more popular recently. And one of the big characteristics is flowers and interiors inspired by homes in the Provence region. There will always be people who want an avant-garde, eclectic design. I have nothing against that. 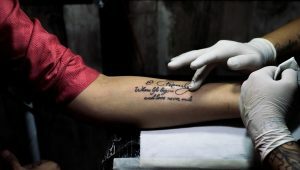 This design, for example, is tailor-made for people who want avant-garde and unorthodox designs. Yes, it looks glamorous and luxurious. But it’s a bit too much, don’t you think? You can’t escape the cherry blossoms. When there is a festival for cherry blossoms, you just know that it’s one of the most beautiful things you’ll see. 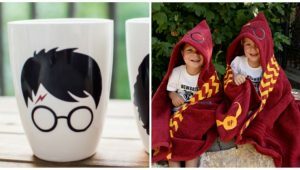 So, why not add them to your bedroom? After all, you want beauty in the room. This is right out of the contemporary design playbook. We have all the lines, forms, and shapes that are characteristic for contemporary design. And it’s a mistake to think contemporary is all about white. In fact, purple shades like this one are just what you want. Black might be a bit too much for some people, which is why we refresh the art with some flowers. By adding flowers, you neutralize the dark tone of the black. And all while adding some fresh and natural elements in the room. This design has everything: color, texture, and beauty. Adding texture in the room adds depth, giving a whole new dimension to the interior. But back to the colors—red and white is sometimes a better combination than black and white. 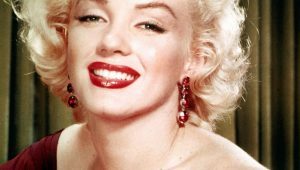 You still stick to the classics, but red is more vibrant and lively. I’m sure not many people will like this. After all, not many people will understand the art. But Japanese (and Asian) culture in general has slowly entered Western interior design. 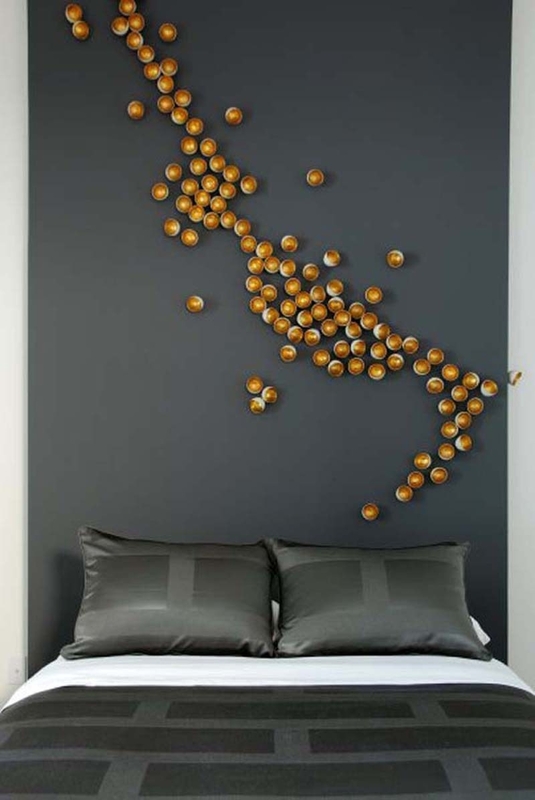 And because of that, you get small touches like this wall art. 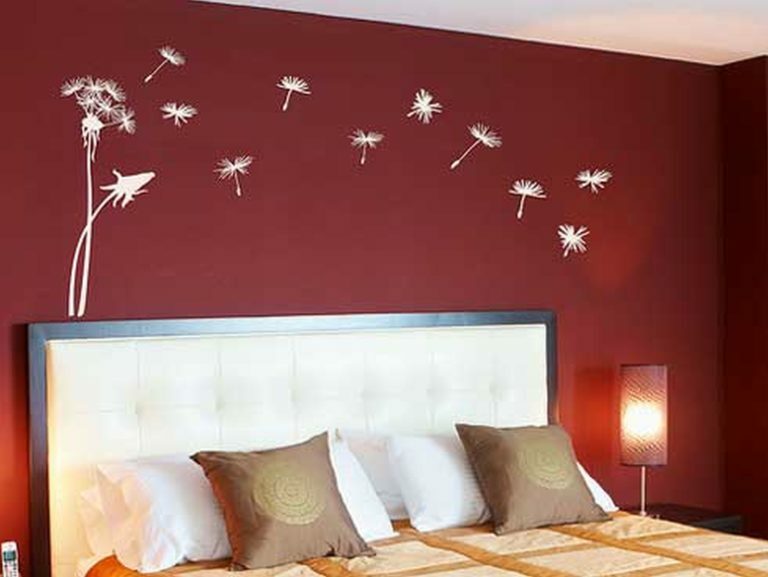 Flying dandelions are as simple and as classic as they come. 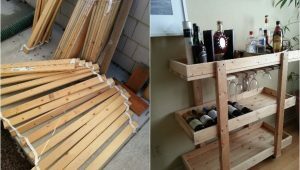 When you want to stick to basics and do something simple, this is all you need. You can change the color of the wall if you want and go with something more natural, like green. 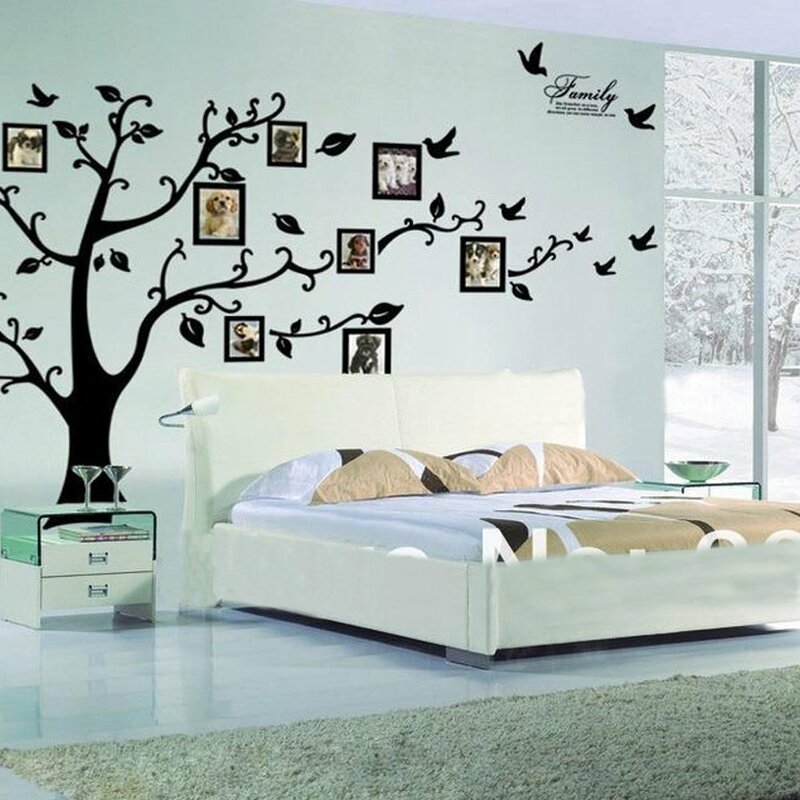 Family trees are usually a decoration you find in the hallway or on the wall next to the stairs. But I like when people think outside the box and experiment with decorative pieces. The tree itself is great enough, but the pictures add a personal touch as well. Look at this design as a different take on a contemporary interior—it’s all about unique forms and shapes. And gold balls are as unique as they come. You add color to the room, and you instantly have something that pops out. 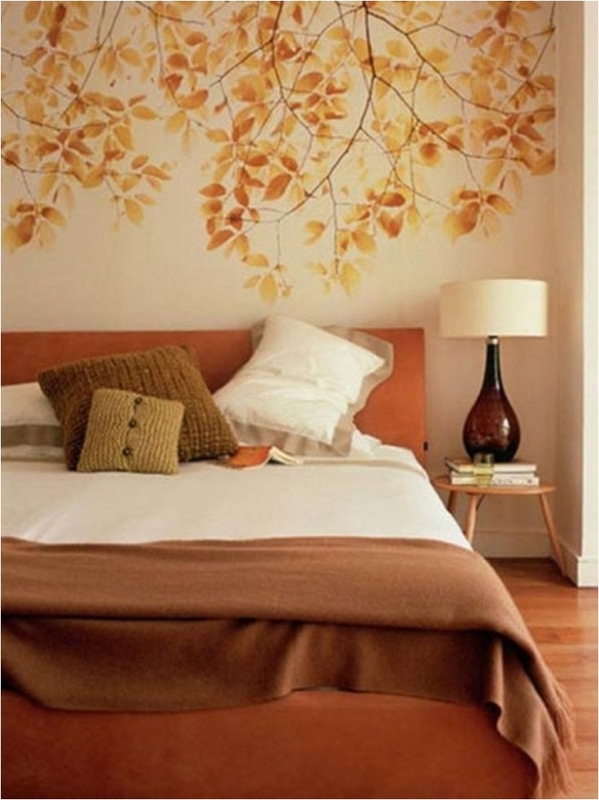 If you’re feeling melancholic, and you want to express those emotions in your room, fall leaves will help you. Just gaze at them for a while, and emotions instantly start to flow. If that is something you like, go for it. 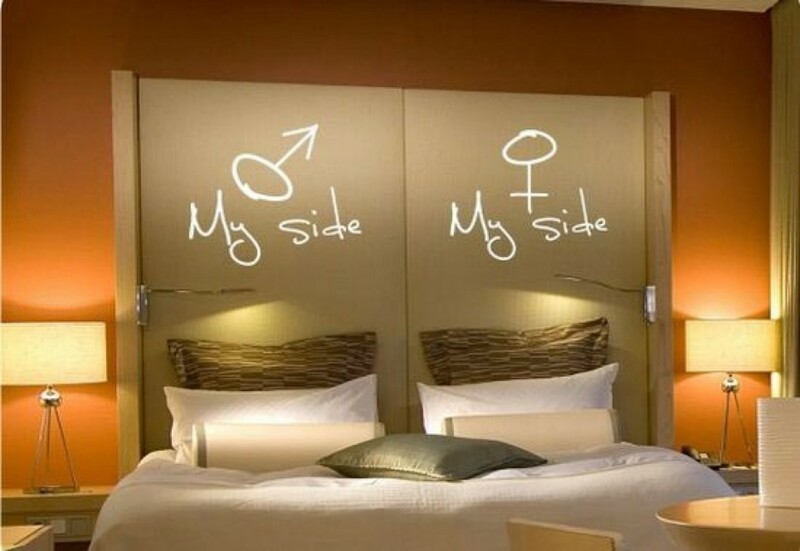 I’m sure you’ve seen the “his and her” bed sheets, which have become very popular recently. But this is just another take on the joke. You can recreate the joke with art, not just bed sheets. You’ve probably noticed by now that we had quite a few flower designs. And they were all different. We had some contemporary floral designs, some minimalistic, and some French Country-inspired. And that’s the beauty of flowers—they’re so versatile. You can find different flowers for different purposes. 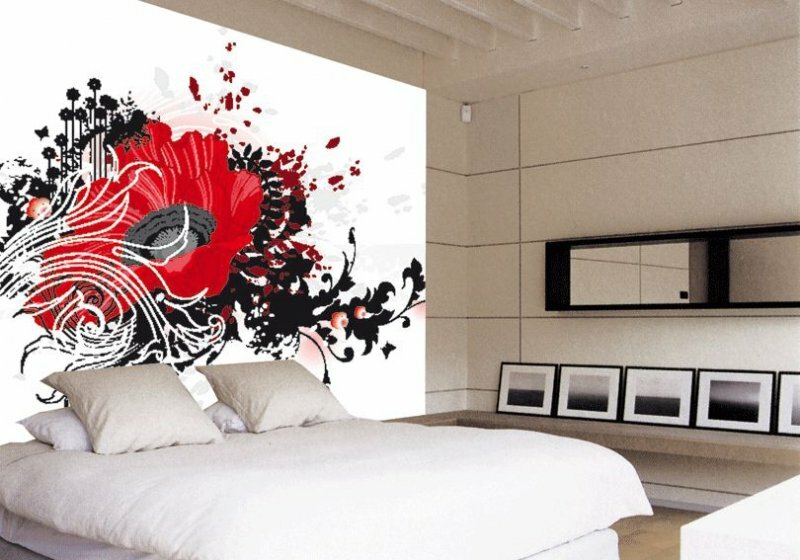 I talked at the beginning of this article that wall art is actually an inexpensive way to add a painting masterpiece to the bedroom. Well, this is as literal as it can be. Basically, you have a masterpiece made with wallpaper. 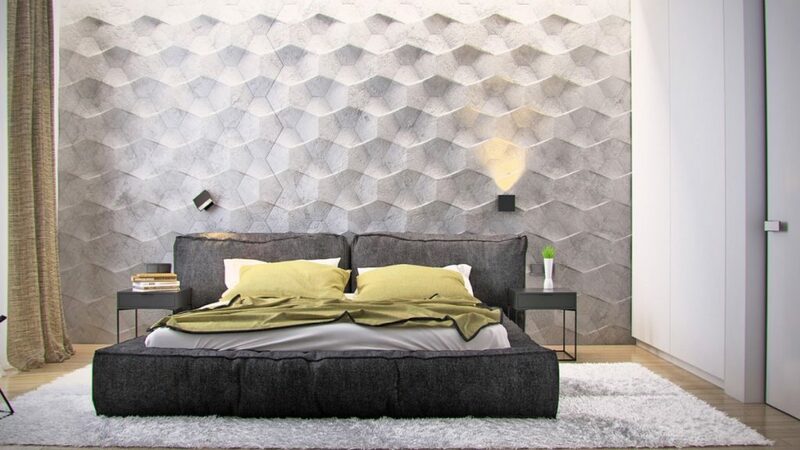 Geometry is another trend that’s slowly entering interior design nowadays. The reason is simple: Scandinavian style. 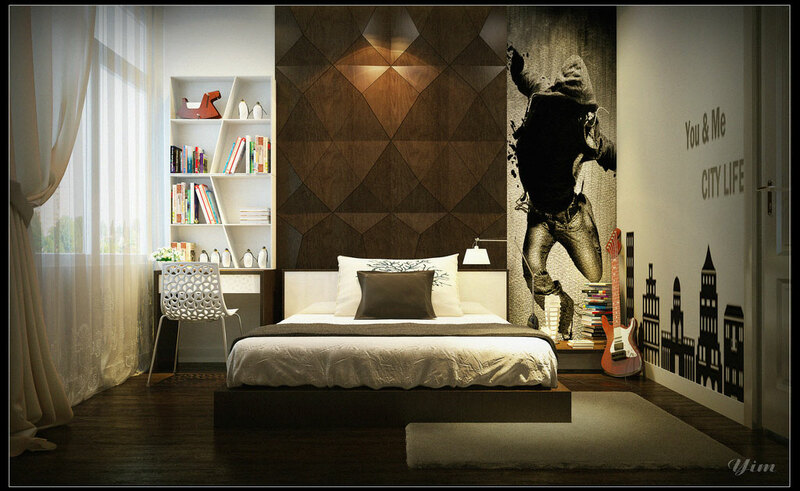 This style emphasizes simplicity and minimalism, with geometry being one way to make your room look interesting. In this case, you can certainly say that geometry wins, because without it, the bedroom is just another dull and boring, all-white room. 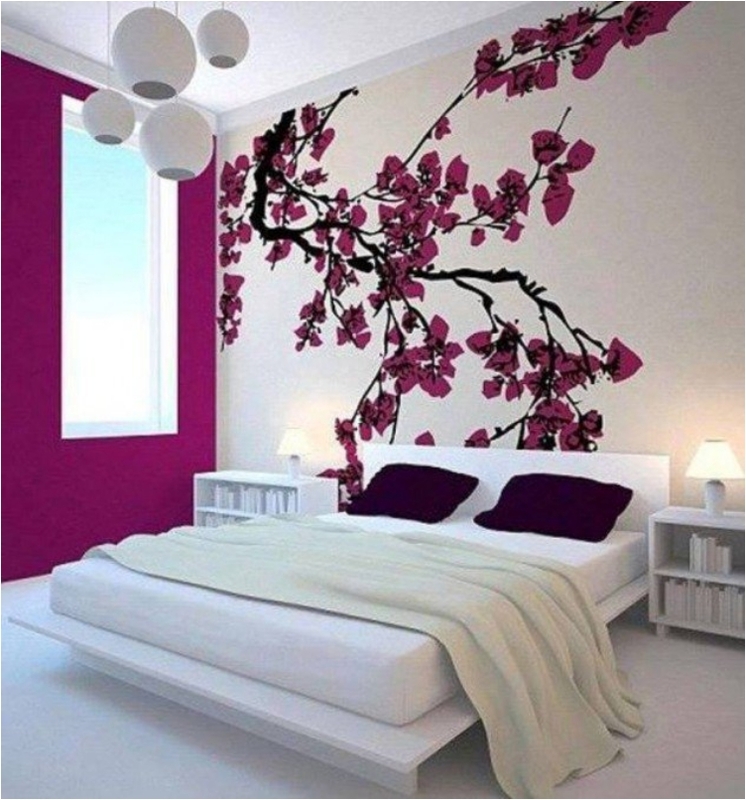 Not many people want vibrant colors in their bedroom. I must warn you: interior design experts say that vibrant colors encourage energy, and you’ll have trouble relaxing and sleeping in the room. But if that isn’t something that worries you, these colors are definitely something to consider. There is a simple reason why we have so many nature-inspired designs. We live in an era where people are slowly understanding the importance of the environment. 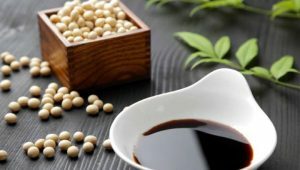 Being and going green has become a trend. So, you can jump on the bandwagon with a simple wallpaper design. 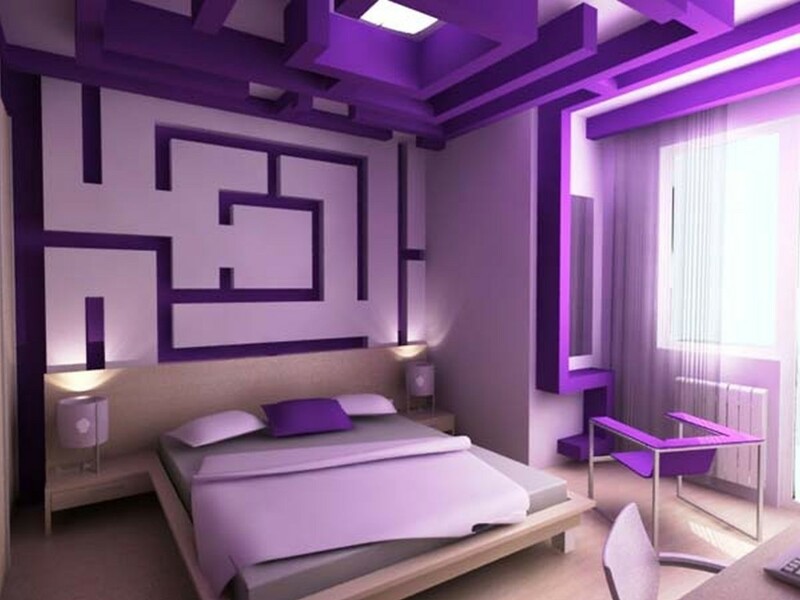 I mentioned earlier how bold and vibrant colors in the bedroom can be a problem. I must admit—it will be hard to relax in this room. There are just so many distracting elements that will draw your attention. But you can’t deny that it looks awesome! We had a luxurious and glamorous design earlier. But that was a bit avant-garde. 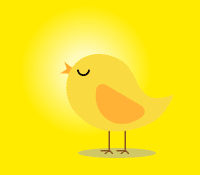 This one, on the other hand, sticks to simplicity and elegance. It’s a completely different take at being glamorous. Just add diamonds, and you’re all set. I must say, hibiscus is an underrated flower. I don’t know why, but maybe it’s because people think of it as an inexpensive flower. But the colors in nature are just flawless, and you bring those same colors to the room. Considering the fact that the interior is all-white, you can add a splash of color here. Yet another take at the contemporary bedroom decoration. Black and white is a staple in decorating. And I love the stripes in this case. But the clock decoration—that’s definitely something that you can’t miss! One thing to know about flowers: they don’t have to be romantic all the time. 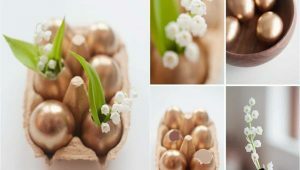 There are ways you can make flowers abstract, unique, and even avant-garde if you like. It all comes down to the style you want. And flowers allow you to experiment. As with the hibiscus a while ago, flowers add a splash of color to the room here. We had geometry in a monochromatic way previously, and now we combine geometry and color, thereby adding both texture and color to the interior. And that’s more than you can ask for. Being that I’m a romantic person, I had to finish with one of the best rooms I’ve seen in a while. 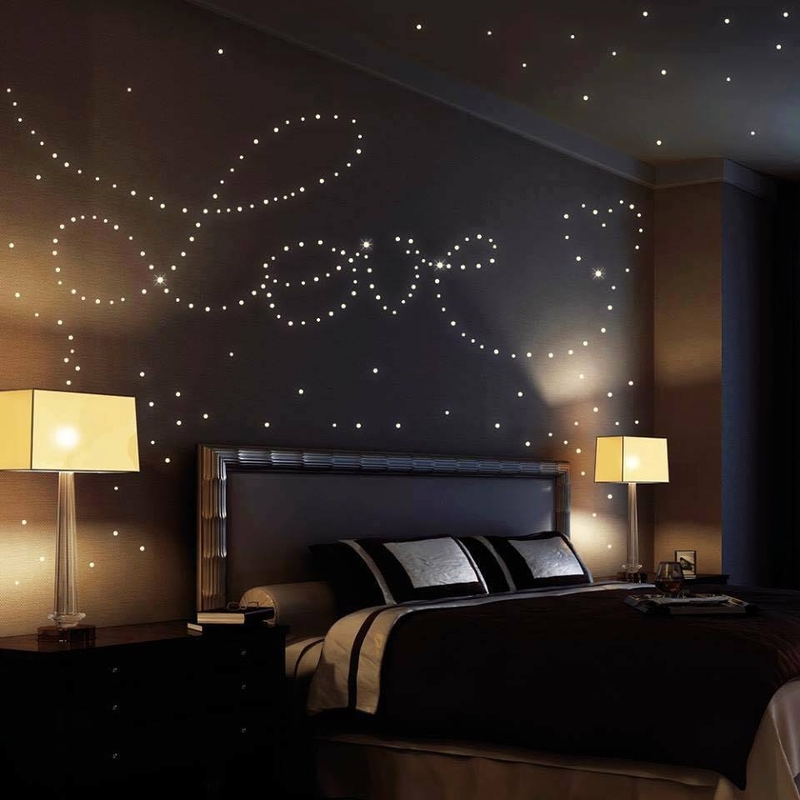 Just a simple “love” written with stars. Now this is a mural I will definitely consider adding! And as always, if you have any other ideas for decorating the bedroom, the comments section is the place to share them.